I still long for Suicide Squad to venture into politics, especially given the sick and sorry state of the US these days, but while I cross my fingers and wait for that, I am happy to be entertained by the latest outing, which brings back two of the original members of the Squad, Rick Flag Sr and Karin Grace. Two issues ago Rob Williams closed the story by revealing that these two characters were still alive after all these years, and this latest issue has current members of the Squad discover their existence, after Amanda Waller sends a mission up to the Moon. As this is merely the first part of the story, I have no idea yet what else will be revealed, but the brief back-up tale, which features DC’s Cold War spy King Faraday, gives a good indication that we will be in for some fun, retroactive continuity. As for this issue, there are a lot of very effective humourous touches. I really love the shots of Captain Boomerang eating KFC while on the toilet. I’m not entirely sure why I love them so much, but it just seems appropriately classless. I do wonder about his boomerang themed underwear though. Were these specially made? The story needs to be told! 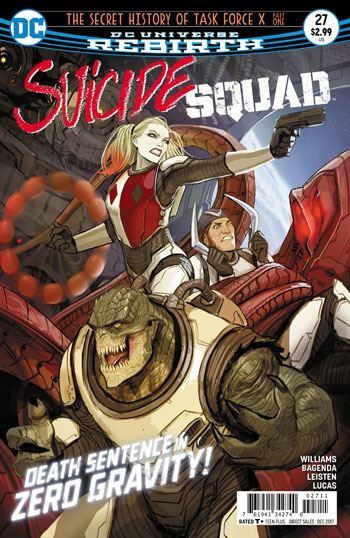 The Squad is given a new team leader, as Amanda was under the control of Gulag when she put Harley Quinn in charge. 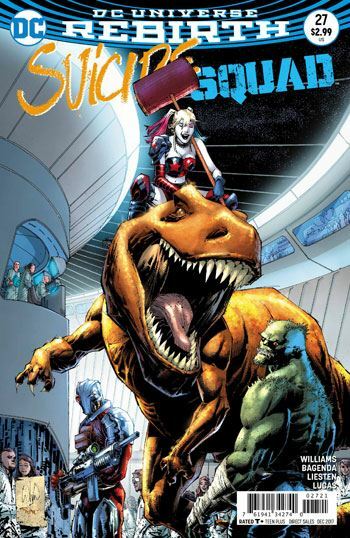 The choice of the new leader is a good one, enabling some much needed development for the character, while at the same time allowing Harley to go back to the manic craziness that defines her. I wish I could heap loads of praise on the art, but I can’t. It’s good. Mostly. Sometimes very good. But that’s about the best I can give it. This book needs a permanent art team.